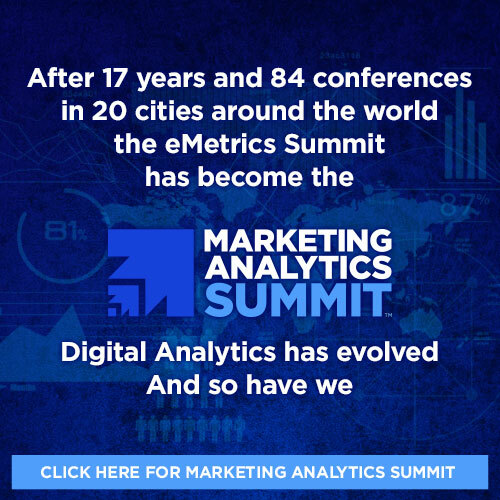 The eMetrics Summit brings together marketing analytics practitioners, experts and visionaries to discuss capturing and applying insights from data. Take a deep dive into the latest strategy, tactics and tools necessary to achieve stronger, measurable results from your digital marketing campaigns. Who should attend eMetrics Summit? Jim Sterne: one man quote machine. Excited to hear the mobile experiences of attendees. Boot Camp 101: I’ve been doing this for 3 years and I still learned stuff. Wish I could’ve taken it when I first started. Love when the speakers show examples of their work. The roundtable session was informative and fun. Great keynote speakers from B2B Industries. Looking forward to more great knowledge. I always learn new things at eMetrics. Excellent experience, great content, learned a lot, met some really intelligent people and will definitely recommend it to anyone interested in the field of Digital Marketing. eMetrics is a great event to network, learn, share and get inspired from the success of others. My first eMetrics Summit. Was everything I thought it would be, and much more! eMetrics reassured me I am doing things right but inspired me to do them even better! eMetrics once again delivered a fire hose of new ideas, great people and community. My first eMetrics was a blast and packed with valuable learning. Definitely will not be my last. eMetrics is the best vendor neutral event in digital analytics – it can’t be beat for learning across a broad range of perspectives, industries and technologies. After three years without attending eMetrics I have to say that I have enjoyed it very much as always. Personally this Summit has exceeded my expectation. Thank you to Jim and all the Rising Media team! eMetrics is a must-attend event for me. As someone who specializes in emerging platforms, being on top of the most progressive thinking in analytics is essential for me and I always walk away from eMetrics with new ideas to put into practice. I thought I was crazy about digital analytics, my assumptions were confirmed this week at eMetrics. eMetrics once again brought together a great collection of top industry minds to share how they’re grappling with the increasing variety of analytics challenges we’re facing. Lots of great people. Really helped me figure out where I fit in within the analytics ecosystem. More than worth the cost. Thanks for hosting such an outstanding conference. I must admit, I didn’t know how much value eMetrics would provide, but I took away a number of new learnings that I found to be quite valuable. So thank you again for putting on the conference and delivering so much more than expected! Thanks for putting on a great conference. It was great to hear what others had to share. I hope to be getting more of my colleagues to sign up for future shows. The recommendation to attend is among the best career advice I’ve received to date. I thought the conference was amazing and I learned a ton! I have definitely changed my approach to my role here. Seriously, I would tell all of my friends to go to an eMetrics Summit “as-is”. Many thanks for putting together such a wonderful conference and community. One of the reasons I came to the show was to find potential vendors that could help us with our needs, so the exhibit set up was great. and I really appreciated the 2 minute “rapidfire” vendor explanation session. Incredibly valuable and helped me find a couple of potential vendors that I may have missed if I just wandered from booth to booth. I love listening to compelling people just talk about the way they solve problems–just hearing how they process the information is of great value. Great job on the conference. It’s definitely the best conference I have been to in years. I just wanted to express to you how much I got out of the eMetrics Summit in San Jose last week. This was my first eMetrics, and it was wonderful meeting of so many dedicated people who “get it”. I liken web analytics to financial accounting of the web product world. Our company’s front line to understanding our products, customers, users, and businesses. The folks I met last week, who were either doing, or preparing to get started in multivariate testing were most helpful in my understanding how to best take advantage of the these tools unique to our industry. Hearing from people “just like me”, who are working to improve the usability of their web products, is invaluable. The Scene: Me, back from eMetrics. The Location: Office of the Executive VP. The Topic: I casually drop by, to discuss my interest in links. Me: …if we can get links from sites like that…. Exec VP: [doesn’t understand, but pretty much glad to see anyone this excited about something] Me: …that’s why links are so important. Exec VP: [eyes go to 5% glazed over] Me: …so that’s why I’m so interested in 301 redirects. Exec VP: [eyes go to 10% glazed over] Me: ….it’s a pretty obscure topic. Exec VP: [eyes now 15% glazed over] Me: …[thinking fast] …but anyway, I’ll shield you from all that. What’s important is that you give me education and resources, I’ll give you business. Exec VP: [eyes clear, smiles, expression says, “This guy gets it.”] Me: …[turn to leave] Exec VP: Great to have you back! With a half day still to go, everyone I’ve talked with seems to view the event as a great success in terms of information shared, value delivered and networking opportunities. eMetrics succeeds again in creating an environment for professionals who share a common passion for analytics, multivariate testing, optimization and the pursuit of knowledge through customer interactions. The conference was fantastic, I really learned a lot and it was a great chance to connect with industry peers. Hands-down the most valuable, informative conference I have attended in the past 10 years. Frankly, I did not expect to gain a better understanding of the concepts of Web analytics like this by participating in this event. Although I did not notice it immediately after returning to Japan, I found myself looking at things from new perspectives when I returned to the workplace. The subtitle of this eMetrics Summit is “The Big Picture.” And indeed, I seemed to obtain this bird’s-eye view. Well, it’s over and I am tired. It was a great event. My head is still spinning. Jim Sterne’s eMetrics Summits are a premier destination for learning about all things Web Analytics. I have spoken at past eMetrics summits and am a Net Promoter of the events (eMetrics DC ’06 reflections). So my impressions of eMetrics overall is, to some extent, one of sensory overload and it will take me a bit of time to process it all. This has actually been my sixth eMetrics Summit and we have both come a long way since the first one I attended in Santa Barbara in 2003, sitting in a room with 80 other people. This event has obviously been a lot bigger with more people and more speakers. But it has also made more impact because we are not focussing on the data that comes out of a web analytics system and debating to death the differences between logfile analysis versus page tagging. Web analytics is necessary but not sufficient. The issues have moved on and the good news is, so has this conference. The October 2006 Washington DC eMetrics Summit was ground breaking in terms of its size and its breadth of focus. These eMetrics Summit reviews are becoming a tradition on my part, but there was something quite special about the industry maturity and scale that this conference reflected. Thanks for an enlightening conference, at an elegant venue, with a high schmooz factor. The eMetrics Summit in Santa Barbara was a big hit. I’m always amazed by the enthusiasm and openness that practitioners … have about their craft. …There is a great bursting of excitement when you get to talk to others who really understand and appreciate what you do all day. There was way too much great information presented to try to summarize here, but here are my three top take aways. Thanks again for a great conference. It was awesome. The conference moved along beautifully, the food was great, the location was fantastic, the way you broke up the time between formal presentations and the discussion groups was also great. Hands down the best event: Great presentations, Great accommodations, Great conversation. I really enjoyed hearing how small orgs do digital analytics in terms of projects and tools. Love the organization behind this conference!! And so much learning. The most experienced, knowledgeable people in the world of online marketing reveal their wisdom and insight about leveraging data for competitive advantage – each one a can’t-miss presentation. Frameworks, strategies, blueprints, tricks and tips. Major brands and leading consultants impart their best advice for collecting, integrating, testing, correlating and making the most of online data. From change management to data governance and from analytics maturity to advanced visualization, this cadre of authorities covers the management side of getting the biggest bang from big data. Nobody Knows the Trouble I’ve Seen – From the start in 2002, the eMetrics Summit has been the place to discuss and share our common problems. These are your people – they understand your situation. Share your problems with like-minded professionals is your path to answers, and a little empathy. The One Weird Trick I Wish I’d Known Sooner – Time to pay it forward by sharing the best advice you’ve got. This isn’t just for laughs, the best tip wins cash. Your table will have 30 minutes to share tips and decide which one is the very best… and then it’s an open competition. The entire audience will choose which hint, tip, trick or recommendation deserves the eMetrics Summit Top Tip Award and a crisp, new $100 bill. It’s time to get serious about growing your network. You’ll have one minute to give your elevator pitch and one minute to get to know your neighbor. When the bell rings, it’s time to switch and meet the next one. The very best way to meet the most people in the least time to find those you want to connect with further. If you value your career, bring a stack of business cards and get ready to introduce yourself. Breakfast, Lunch, Breaks and Receptions are your chance to grow your network. Do not hide in the corner or think your email is more important than meeting people!